Death or Glory. Hauntsan Sur. Peru. Expedition Report 2006. | Great Escape. Nick Bullock. Break Out. Nick Bullock Interview by Ray Wood. Bullock BIO. A list of dates, names and numbers. Chang Himal film from the Piolets d Ore.
From There to Here and Beyond. A brief history. Echoes: The Book & Reviews. Ian Welsted, 2018 Banff Book Competition Jury. Review of Tides from Robert Taylor. A review of Tides on Amazon. The Project Magazine review of Tides. Tides review by Robert N on Amazon. Tides review by D Elliott on Amazon. Tides: The first review from Dennis Gray on Footless Crow. 2016 British West Nyainqentangla Expedition. Annapurna III Southeast Ridge.Expedition Report 2010. pdf. Chacraraju SE Face Expedition. 2004. Chang Himal (Wedge Peak) Expedition Report 2009. Death or Glory. Hauntsan Sur. Peru. Expedition Report 2006. Kyashar, Nepal, Expedition pdf Report 2011 & Balloons, blog report about the expedition. Peak 41. Alpine Style, Final Report 2008. All Roads Lead to Scotland. The film by Coldhouse Collective. Centurion and West Central Gully. Far from perfect Scottish winter climbing conditions. Echoes. Outside is Hot and Sticky. The full film from Polished Project. Echoes. Outside it’s Hot and Sticky. Trailer. Frumious Bandersnatch Film by Posing Productions. Grand Pilier D’ Angle Film by Keith Ball. Lofoten winter, battling and new routing film clips. Melody teaser from The 2 Rays. Nico Favresse meets the Nightmayer. Nyainqentagla South East. Tibet. The film of the climb. Piolets d Ore film of the 2016 British West Nyainqentangla Expedition. Bertrand Delapierre. Godzilla. IX/8, Beinn Bhàn. Coire Nan Fhamair. Scotland. Cracking Up. Clogwyn Du. Wales. The Mount Everest Foundation, the British Mountaineering Council, the Sports Council, Mammut, D.M.M. Vasque. Patagonia. Osprey and hilleburg. Location: The Cordillera Blanca of Peru. Climbers: Nick Bullock and Matt Helliker. Abstract: A new route on the North-east Buttress of Huantsan Sur. Originally intending to attempt the unclimbed couloir on Huantsan main peak, we changed our objective to the Northeast buttress of Huantsan Sur thinking that it would be a safer option, as the weather was very unsettled. The buttress was successfully climbed and called Death or Glory. TD/ED. 1000m. 9th June: fly from Heathrow Airport London. Arrive in Lima and travel to Hauraz by the overnight bus. 10th June: Acclimatisation and food shopping in Hauraz. 11th June: kit preparation in Hauraz. Acclimatisation. Plan and shop. 12th June: Waiting in Hauraz as every afternoon thunder and lightening storms have engulfed the range. 13th June: take taxi to Quebrada Llaca for acclimatisation. 14th June: Weather settles, walk to 4800m. The planned scramble to the Co Rima Rima ridge at 5200m is aborted due to not having technical gear. 15th June: Return to Hauraz. Sort kit in Hauraz. Shop. 16th June: Food shopping in Hauraz. 17th June: Travel to Chavin by bus and set in motion the task of finding an Arriero and donkeys. 18th June: 6-hour walk to BC at the head of Quebrada Alhuina. 19th June: Load stash under SE Face of Huantsan and check the line. 20th June: Load stash and climb the snow cone to the start of the couloir at 5000m. Return to BC at 4400m. 21st June: Sit out bad weather. 22nd June: Sit out bad weather. 23rd June: Sit out bad weather. 24th June: Sit out bad weather. 25th June: Leave BC at 0830 and walk to stash at 4800 beneath Huantsan. Sort kit, decide the line to be climbed on Huantsan Sur, and start to climb at Midday. Reach 5500m and bivouac. 26th June: Start climbing at 7am, reaching the summit at 3pm. Abseil the line and bivouac at approximately 5600m. 27th June: Leave the bivouac at 8am, abseil the snow and ice and down climb the lower rock section reaching the base of the climb at 1pm. BC was reached at pm. 28th June: Bad weather returns, wait at BC, as the Arriero is not due until the 30th. 29th June: Bad weather. Rest at BC. 30th June: Arriero arrives at 0730. Leave BC at 0830, walk to Chavin. Arrive at Chavin at 1245 and catch the bus to Hauraz, arriving in Hauraz in good time for a beer! 1st Drink coffee in Hauraz, sunbathe, and eat nice food. 7th June: Fly to Heathrow. 8th June: Land at Heathrow, expedition ends. The timings for take off were a little inconvenient but the transfer timing was good. The early evening landing in Lima was convenient as we were able to catch the night bus leaving at 9pm from the Ormenio/Ancash Central station, Carlos Zavalla, 177. A sur-charge will have to be paid for extra baggage, generally doubling the cost of a ticket, which is approximately £5. The journey to Hauraz takes approximately 8 hours if travelling by day and 5.5 hours overnight. The Journey to Chavin is by the Chavin Express, a slight contradiction in terms! The service runs daily from Hauraz leaving at 8am. £2.00 per person from the Chavin bus terminal at M Caceres 338 a block from Edwards Inn. The journey can be as quick as 2.5 hours or as slow as 11hours! There are several bus companies running daily from Chavin to Hauraz. The times of departure are early morning, 1pm and 7pm. There are more I’m sure. We didn’t pay extra for luggage which was piled high on the roof to make space for the heard of sheep stuffed into the boot! Hauraz is a bustling, thriving city, but once out of its dusty grip the people live a very simple farming, pastoral existence. Cows, sheep, goats, donkeys and chickens are numerous, as are dogs! Where the land is too steep to plough, gum trees grow, as well as grass and cactus. Wheat is grown extensively, as are potatoes and other root crops. Higher in the valleys, groves of ancient Quenal Trees give the slopes a tropical and mysterious feel. Chavin is the small town on the east of the range that is the setting off point for Huantsan BC if you want to climb on the East Face. Be prepared for a very different experience than on the West of the range. The people of Chavin are not accustomed to mountaineering expeditions. There are many Arriero’s and horses but the locals are not in the habit of transporting gear for westerners. This causes difficulty in the hiring of mules and because they do not deal with westerners, they do not know the normal cost for the service. If you speak Spanish it will be a great help. The people in Chavin are very friendly and helpful though. We stayed in the Inca Hostel and after an hour of very broken Spanish and translation book delving, the owner of the hostel ran away to hunt for an Arriero. By midday, the following day, we had our Arriero and two horses. The refreshing thing about this side of the range is with the minimal contact with westerners the locals have not fallen into the habit of inflating prices. The Arriero was honest, hard working and more than happy to take the standard rate, i.e. $5 per horse and $10 per day for himself. Rock: In general rock is not the mainstay of The Cordillera Blanca, although there are exceptions such as the Sphinx on The Esfinge in the Paron. There are miles of solid unclimbed granite in the quebrada walls, which have only recently been touched. On the ridges the rock tends to be very loose but on some of the faces it can be excellent and compact. The rock on Huantsan Sur was generally awful. Ledges had to be swept clean before we could stand and kitty litter covered all of the ledges, edges and crimps. The rock was a mixture of volcanic and slate. On the very odd occasion a solid piece of granite appeared. Snow and ice: The weird and wonderful mushroom formations are what make Peruvian mountaineering very interesting. They form mainly on the ridges. Unprotected, bottomless, and very scary. If treated with disrespect, the ridges of Peru will be your downfall. Double cornices form readily and hang over the faces threateningly. Sometimes it will be impossible to top-out because of the cornices hanging over your line. In general the north Faces will be of good nèvè and ice because of the sun they receive, but a word of warning, don’t get caught on them in the midday sun, especially without anti-ball plates! South Faces tend to be unconsolidated due to the lack of sun. Deep powder can make them a struggle although in the last four years I have found the steeper they are the more readily ice forms and the mixed climbing can be excellent. 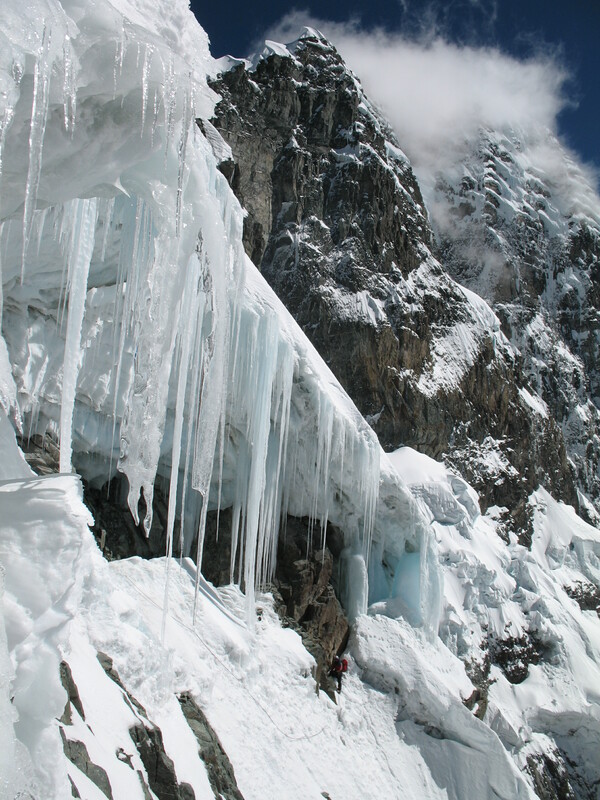 Specifically on the route we climbed overhanging seracs and massive umbrellas of ice were in abundance. Weather: Normally the settled weather patterns in the Cordillera Blanca are the reason to climb there. Unfortunately for a large period of our time at BC the weather was unsettled. I have found since, the East of the range does suffer with worse weather than the West. We only had three days of clear weather for the Twelve we were at BC. Waste Management: As always a very-minimal approach was taken. All litter was removed and disregarded in Hauraz, the benefit of a small independent team, climbing in an alpine style. Our acclimatisation trip was a bit of a disaster. Due to thunderstorms on our arrival in Hauraz and for the following four days we thought we were in for a tent-bound-time so booked the taxi for a pick up two days later. The sky cleared on the first evening at Laguna Llaca 4447m. Not a bad thing, but the next day we chose to try and make it to the Rima Rima ridge 5224m to the East of our BC. Finding the climbing more technical than expected we eventually backed off. We only reached a height of 4800m and the following morning the taxi picked us up. There were still acclimatisation options even when we were at BC in Quebrada Alhuina. Rurec was shown on the map to have a standard, but steep unclimbed East Face. This was not so. Global warming has done the damage and this straight forward looking face on the map, was a black shale cliff with overhanging seracs. Quebrada Alhuina is a cul-de-sac, headed by Nevada Rurec 5700m, Huantsan Sur 5919m, Huantsan Oeste 6270m, and the formidable Huantsan main peak 6395m. At the time there were only two routes in the whole valley. We made do with walking to the base of the route one day with ropes and the second day we took the rack, crampons and axes so we could climb the snow cone at the base of the couloir at 5000m. The weather then turned once more and the next four days were spent reading and waiting. The intended line, a splitter couloir between the main peak and Oeste was not to be. Very unsettled weather made the line unfavourable. We looked elsewhere. To the left of the couloir, Huantsan Sur stood, with ridges and buttresses. A totally independent peak, pointed and stunning and much more suited in the present climate. After waiting it out the snow stopped, and we went for a walk with bags packed. On the 25th we left BC, 4400m, at 8.30 a.m. reaching the moraine beneath the face at 10am. Deliberation on which line gave the best chance of success and gear faff took another 2-hours. Finally, at midday, we began our line, the central North East buttress starting at a height of 5000m. The buttress can be split into thirds. The first being rock (of a kind!). 200m of loose and crumbling, V-diff climbing with a pack and big boots. Brushing the holds before crimping was de-rigour. Knocking, pulling, testing, before committing was essential. Keeping close, we soloed, with no trustworthy placements for gear, and as the shale, gravel and tiles flew, it was better to be near. At the top of the rock section crampons were donned, axes pulled, and the rope was connected. This middle section of the climb proved the most testing as we sneaked and sprinted, passing beneath, on-top-of, around, and through, countless seracs. Overhanging, cracked and creaking monsters threatened. Massive umbrellas of wind-blow, icicle-encrust overhangs loomed at the top of the runnels we ran, and in the afternoon, the sun shone. Speed and luck was our friend. At 5.30 pm we made a bivouac on rock on the left of a gully, near a massive umbrella, at a height of 5500m. The night was tense, a serac high on the face decided to carve, after the first lumps hit us, we cowered. 26th. Leaving the bivouac at 7.am the massive umbrella with free-hanging icicles, as thick as telegraph poles was climbed beneath. An exit was first sought on the right, but finally after a complete traverse beneath it, a way out was found on the left. The climbing was pitched from here, as being hit by falling debris was a concern. 60m. A right traverse across a snow slope, avoiding the television sized lumps of ice embedded into the snow beneath the serac that had caused us sleep depravation, was a worry. 60m. Nervous anticipated followed as the deep ice gully was followed, but luck was still with us, it opened out onto the summit snowfield spotted from the base of the climb. 70m. Now on the final section, the 60° summit snow slope, we moved together for the last 170m, hitting the left ridge just below the summit. The summit was reached at 3pm. The descent was a fraught and torrid affair with one bivouac beneath the massive umbrella of ice at 5600m, reached at 7pm. All of the snow and ice sections were abseiled using rock or ice anchors. The rock section was down climbed. Throughout the whole of the descent a constant check above was taken. The base of the climb was reached at 1pm on the 27th. Base Camp was reached at 3pm. The weather broke the next day. For Nick Bullock all clothing, rucksacks, duffels and sleeping bag were supplied by Mammut, they all performed as expected, perfect. The boots used were Vasque 9000. The most comfortable and warm boots I have used. For Matt Helliker all clothing was supplied by Patagonia. Boots by Scarpa and rucksacks and duffels by Osprey. All performed excellent without exception. Hilleburg supplied his tent. Mammut and D.M.M supplied all hardware and ropes. Stove and Fuel: A Jetboil stove was used on the route. Canisters of propane/butane mix gas was burnt which is now widely available in Hauraz at $5 per cartridge. Food: All the necessary food is available in Hauraz although a few favourites were brought along. High-energy drinks are not available in Hauraz so bring them also. Below is a summary of the finances for the trip. We were fortunate to receive grants from The MEF/BMC and The sports Council. Patagonia also helped with a donation at the last moment, which helped a lot as the prices of plane tickets have increased, and with not travelling by American airlines we knew extra cash would have to be found for the baggage. The grants and the money from Patagonia eased the financial burden considerably, and if had not been available the trip would not have taken place. Nick Bullock and Matt Helliker would like to thank Libby Peter and Stu McAleese for the references. Also the M.E.F./B.M.C. The Sports Council and Patagonia for grants, which made this trip possible. Thanks also to Mammut/D.M.M. Vasque. Patagonia. Ospray and Hilleburg. INTERVIEW: Nick Bullock – Comfort by Marc Langley on UKC. Nick Bullock on Spray… Ice. Regan Smith on Spray… Ice. Nick Bullock on Tides: The first review from Dennis Gray on Footless Crow. Raúl Reig García on Tides: The first review from Dennis Gray on Footless Crow. Authors to read before you die! Baggy's Blog of Welsh Winter Stuff. Air Dynasty. Nepal Helicopter Service.